That brings me to examine the myriad and most effective ways to relieve that unbearable itch. The next best way would be to find an implement long enough to reach that unreachable spot. Quite often, a pen or pencil will do the job nicely. Don’t forget to use the non-writing end of the pen, though, or make sure it is capped. Ink isn’t always easy to get off your skin, and if you had to bare your back, for whatever reason, people might wonder at your unusual tattoos and try to figure out which prison you got them in, or if you had a very bad tattoo artist. Pencils don’t write quite as easily on skin, so it doesn’t matter which end you use. The pointy tip is generally more effective. However, it does matter if you’re wearing a light-colored top. Pencil marks on that don’t rub off easily. To be safe, just don’t scratch with the writing end. You can also use a ruler, which is longer and good for that itch which is somewhere dead center so you can reach it with neither the overhand nor the underhand scratch. Rulers are also better for taller people with longer backs. You get the picture. One of my personal favorites is a paint brush–not a house painter’s wide brush, but rather the artist’s long, elegant paint brush (such as I prefer to use). The handle tips are very effective for scratching that damned spot, although, I have been known to sometimes have multi-colored hair in the back of my head. Around the house, you’re more likely to find all manner of implements besides pens, pencils, rulers, and paint brushes (but the last only if you happen to be an artist, of course, or have a child in the house with a handy paint set with a brush that hasn’t disappeared under a couch or fridge or some other inconvenient piece of furniture or appliance you can’t reach under). Thinking of children, you could use their little plastic bows and arrows (if they have a set conveniently lying around) or assemble a Lego tower (again, if they have enough pieces you can find). Rummage around your closet and you could use a hanger or a mop or broom handle, depending pretty much on which closet you’re rummaging through. A long-handled shoe horn can also be very effective. Cooks, chefs, and other kitchen workers have a distinct advantage because their cooking implements are generally close at hand. They have rolling pins (too round, sometimes, but will do in a pinch), whisks, wooden spoons, mixing spoons, cooking forks or turners, and knives (completely inadvisable). The best tool, however, is the pasta spoon or fork or ladle–you know which one I mean. It has perfectly curved claws that scratch as well as a hand–often better, because it has more fingers! It’s infinitely better than a garden fork or clawed hand rake, which tends to have a shorter handle and might be covered in soil. Just make sure you dump the pasta (or serve it) before you use the pasta server. Of course, if I saw a cook do that, I wouldn’t be likely to finish my dinner or ever eat that cook’s food again! Whether it be a lowly pencil or a stainless steel pasta server or a fancy long-handled tangle-removing hairbrush, if it aids you to reach that unreachable spot, to scratch that impossible itch, no matter how itchy, no matter how far, then you have found the perfect spar! Last week, I included the poem, “Trees” by Joyce Kilmer and referred to him as “she/her”, for which I sincerely apologize. I have so many female friends named Joyce that my mind automatically assigns the feminine pronouns to the name. In the same way, I have so many female friends named Evelyn, we forget that it is a male British name, immortalized by the writer Evelyn Waugh. The practice of naming children since the second half of the 19th century has become extremely complex and confusing. Prior to the 60s, people used traditional names in traditional ways. Boys were Robert, Peter, John, or William; girls were Linda, Rose, Marie, or Sarah. Well, sure, there were more names, but the names used were also traditional names, many of which had been used in previous generations. When the 60s floated in with the world-wide flower power, hippie lifestyle, and love generation, people began naming their children after nature, like Daisy, Amber, Hawk, and Rain, or after virtues such as Hope, Charity, and Love. After that, international names became more popular, following the rise of certain celebrities. It did not take long for people, looking for originality, to put a twist in the spelling of traditional names, followed by the invention of names or adapting names to suit the opposite gender, which, by the way, is really common in cultures where the simple change of an ending changed the gender of a name. By the 80s, baby-naming books included popular names from around the world, and the options have been growing in leaps and bounds. Since the 1990s, the trend has been to use gender-neutral names and Ashley, Lindsey, and Leslie have become highly popular, along with dozens of permutations in spelling: Ashlee, Lindsay, Lesley. Many surnames have also became popular first-name choices, such as Branden, Morgan, and Regan. I have subbed in classes where there were several Jaimes, both male and female, pronounced “Jay-mee”. In the Spanish-speaking world, Jaime is pronounced “Hai-me” with a short e and is a masculine name, the Spanish equivalent of James. Multicultural exposure in the western hemisphere has also presented parents with more child-naming options, and besides French, Irish, and Scottish names proliferating in North America, parents are looking to Russian, German, and Spanish names to adopt. So what can you find out about a person through their names? Nowadays, it’s safe to say, almost nothing, because who knows what Morgan’s gender is? Nonetheless, if you are choosing names for your characters, it’s safe to do a quick name search for popular names from each year to match your character’s dates of birth as well as place of birth. Let’s just say it’s not likely to have a North American born in the 50s to be named Shakira. You can write any time people will leave you alone and not interrupt you. Or rather you can if you will be ruthless enough about it. But the best writing is certainly when you are in love. Valentine’s Day is around again and, while that might not mean much to some people, it certainly means something to the masses victimized by commercialism. At the very least, it’s a good time to reflect on love and its accompanying emotions. Yes, love afflicts people with various emotions, depending on the situation. When we fall in love we are elated, feel joy, happiness. Sometimes we become obsessed with the object of our attentions and we end up despairing, miserable, insecure, and uncertain if the attention is unreciprocated. If the one we love loves someone else, we become jealous or envious, which can lead to anger and rage. When we lose love, we go through sorrow, grief, despair, and misery all over again. When our love is reciprocated, we become excited and exuberant. Clearly, love is one powerful emotion that floats us up to cloud 9 or has our heads in a tizzy. No wonder people celebrate Valentine’s Day. It brings the promise of so much more than just chocolates and roses. It reminds us what it is to be alive. Imagination is enhanced by inspiration and, usually, the best inspiration comes from being in love. That’s probably why literature is littered with so many love poems, songs, and love stories. Love and courtship have certainly been the motivation for countless historical events, giving rise to a couple of eras when the subject of literature revolved around the themes of courtly romance, chivalry, love, and beauty. Even outside those eras, there has been no shortage of literature dwelling on similar themes. However, I believe imagination is likewise enhanced by any other powerful emotion. A great deal of writing has emerged from anger and rage, fear, despair, grief, depression, and joy. Inspiration certainly is not limited to what only those emotions evoke—humans are afflicted with myriad emotions in varying intensities and writers take advantage of that. Writers are moved to express the infinite nuances of each emotion in countless ways and fill millions of shelves with the whole gamut of emotions pouring out of millions of characters that entertain and—yes—inspire the reading world. Writing is as technical and scientific as it is creative. Yes, even when you write creatively, there is no end to the use of scientific methods. Those of you who remember science classes will recall the scientific method requires (1) observation, (2) questioning, (3) hypothesizing, (4) experimentation, and (5) conclusion or generalization. We use the same skills when writing creatively. How? Let’s begin with observation. Writers observe the world around them, probably more so than any other people. It is from observation that writers find topics to write about. From observation, writers are able to create detailed descriptions of just about anything. How else would you describe the expressions on a person’s face who receives news of a tragedy—the widening of the eyes, the jaws dropping slightly or more, the blank expression of being unable to comprehend, and then the realization of the actuality. You watch people as they react to different situations and then ask yourself: Does the recipient accept the news, understand it, control emotional responses? Or does the recipient break down in shock, express denial, anger, depression, pain, or anguish? What emotions are expressed or shown? How are the emotions expressed? Some emotions might show similar facial expressions and body language but there are universal similarities in the way people react and the way they express emotions. The next thing you do is make certain predictions or guesses. What will the person do next? Why did the person react that way? What about the news affected the person so much? Experimentation might not be a very evident step, but when you explore the different reactions to the same situation, change certain factors—maybe where or when the news is delivered, or who receives the news, or how the news is conveyed—you could come up with several possible situations you can play around with. When you know how your characters will respond and commit that to your story, you will have come to a conclusion. The whole process of creating stories involves the exact same process in a gazillion permutations and each combination will be a different story. That’s why you’ll never run out of stories to tell. we know they will live on and on as long as they are read. If you’re like me, you’ll probably be taking advantage of the holiday season to write because it’s a nice chunk off work. Of course, since I’m completely off a regular job, I have all the time in the world to write and paint now, until I find another job. That also means I have all the time in the world to procrastinate. I could make up several excuses not to write or paint: my apartment is a mess, thanks to soon-to-be-gone neighbors; I haven’t decorated for Christmas, although considering it’s two days away, what’s the point in decorating; I’ll be cooking up a storm for Christmas dinner, although considering my apartment is a mess, there’s not much room to debone a turkey, and since all I do is end up eating the same meal every day for the rest of the week until New Year’s, when I’ll probably roast another turkey that’ll feed me until Valentine’s day, so what’s the point, really, of making a huge meal for one person; there are new castle puzzles online and completing them with 500 pieces makes a satisfying couple of hours; I could catch up on tv series and movies I’ve missed and binge watch Fibe On Demand or Netflix; I could try out my brand new Amazon Prime video and catch up on shows that aren’t on Fibe On Demand or Netflix; I could catch up on my reading, finally; I need to finish prepping for my winter courses; I need to clean up my apartment since it’s been a mess for the last three weeks, thanks again to my inconsiderate neighbors; I need to catch up on my advanced courses–and since I haven’t been signing in every week, I’ll need to start all over again just to refresh my memory; I need to resume my French lessons–and since I haven’t touched those books for the longest time, I’ll need to review everything again; I need to update a lot of things on my websites, including adding new content, etc. ; I need to continue making and posting online content for sale; I need to make more new crafts for sale; and the list goes on. There are some things I can do at the same time, of course, such as my laundry and anything else; or keep the TV on as I work on my computer–it’s pretty much how I keep abreast with all the shows I want to see; then I’ll watch them all over again because I won’t remember seeing a thing or will forget the stories because I was engrossed with writing or painting. My point is, we writers are probably the most creative people when it comes to thinking of ways to put off writing. Thank goodness for a weekly newsletter that keeps me writing something. It would be just as easy to set it aside, but we don’t want to disappoint. Whatever it is you decide to do throughout the holidays, may you have the best of the holiday season and wishing you find some time to get a bit of writing in! Merry Christmas, Happy Holidays, and the Best of the Season to you all! What happens when greed drives businesses with no concern for the environment? Theodor Seuss Geisel, better known as Dr. Seuss, has once again dealt with a sensitive and important topic in an immensely imaginative story. He is well known for stories like How the Grinch Stole Christmas and The Cat in the Hat, among others; and like his other books, this one must be read not just because it is enjoyable, but because it delivers a powerful message we need to learn while we are still very young. 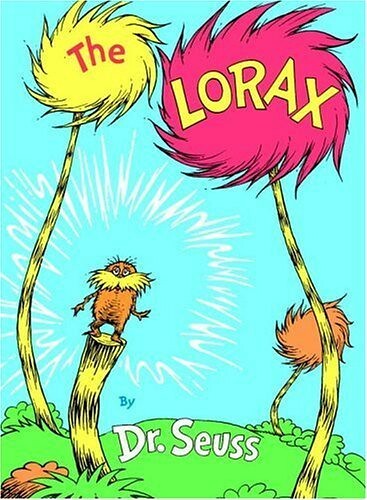 Originally published in 1971 by Random House Children’s Books, Dr. Seuss’s The Lorax was a proverbial warning to care for the environment at the risk of destroying nature. It also suggests that businesses need to assume corporate responsibility for the environment by not exploiting natural resources without replacing them. The story begins with a young boy seeking the Once-ler on a dank midnight in August in a place that is dismal with polluted air and a wind that “smells slow-and-sour when it blows.” According to legend, the Once-ler is the only one who knows about the Lorax and how it was lifted away one day. The Once-ler was a newcomer to the place, which used to be a paradise full of green grass and Truffula Trees that bore fruits on which Brown Bar-ba-loots fed. Swomee-Swans flew about singing beautiful songs among clean clouds and Humming-Fish filled the pond. Discovering how soft, silky, and sweet-smelling the Truffula Tree tufts were, the Once-ler decided to build a small shop to knit Thneeds from the soft tuft. As soon as he finished knitting the Thneed, the Lorax, an unusual-looking creature, appeared, demanding to know what the Once-ler had created and what he intended to do with it. Explaining that he would sell it, the Once-ler immediately sold the Thneed to a passer-by. The Once-ler was happy to sell his ridiculous product so easily and proceeded to invite all his relatives to work for him. He created a large factory to produce more Thneeds. When he wasn’t harvesting quickly enough to satisfy the production, he invented a machine to chop down trees four times as fast. As the trees disappeared, the Bar-ba-loots lost their food source and the Lorax sent them away to find another place where they would have food. The Once-ler ignored him and continued his production because he wanted to become richer from the sale of his product. He increased production and began exporting elsewhere. Meanwhile, the factory spewed more smoke into the air so the Swomee-Swans could not sing. As a result, the Lorax sent the Swomee-Swans on their way to find cleaner air. Besides polluting the air, the factory produced waste from chemicals and dyes that were used to color the Thneeds. This waste was disposed of in the pond and soon, the Humming-Fish had to go. Each time a problem arose, the Lorax appeared to appeal to the Once-ler, speaking for the trees and the animals, which could not speak for themselves. Wanting only to get even richer, the Once-ler continued until, at last, he cut down the last tree. With no more trees or animals to protect, the Lorax lifted himself through a hole in the clouds and disappeared forever. Left with no more trees to supply his factory, the Once-ler’s relatives abandoned him and his factory shut down. The Once-ler locked himself up in his tower-like home and never went out or spoke with anyone else except the occasional person who was willing to pay a bit to listen to his story. In the end, the Once-ler expressed his great regret after having so much time to think about his actions, concluding that the world needed someone who really cared for it to survive. He gave the young boy charge of the last Truffula Tree seed with the advice to plant it, take good care of it and propagate more trees so maybe, one day, the Lorax would return with all his friends and make the place beautiful again. Even if this book was written in 1971, it is still relevant today because it reminds us that we need to take care of nature. The Lorax represents all those who speak for nature and advocate conservation, while the Once-ler represents big businesses that exploit the world’s natural resources with no regard for the future. The story tells us how short-sighted big businesses are when their bottom line is profit and how that can destroy resources, which, after all, are not infinite. The young boy represents everyone else, especially young people, who need to assume responsibility for nature because without our natural resources, we will have no resources at all and an earth that is not fit to live in. It is especially meaningful today because of global warming and the greenhouse effect. We all need to understand how important taking care of the environment is for human survival. After all, without a world, there will be no humans.